314 pages, 8.5x11, spiral bound. Colour C$ 47.95 [ISBN 0-919854-91-5]. 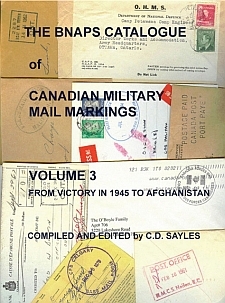 The result of several years of hard work by Doug Sayles, Volume 3 of the new 'BNAPS Catalogue of Canadian Military Mail Markings' is a complete reworking and updating of the previous catalogues published by the late W.J. Bailey and E.R. Toop (B&T). The reworking consists of a completely new numbering system built around keeping cancellations from individual military locations (by era or type) in a single group, and ordering them by marking shape and size. Each new catalogue number is cross referenced to a B&T number if one existed, and in the Appendices there is a reverse cross reference from B&T numbers to the new 'BNAPS' numbers. The spiral binding and heavy paper used in the Sayles' catalogue are intended to allow collectors to use it to record and annotate their holdings and, with luck, find new and previously unreported items. Because the military postal markings of the post-World War II era formed the smallest part of the B&T catalogues, Doug decided to start with them and to name this Volume 3. All cancellations, both those previously recorded and the more than 650 new cancellations unknown to B&T, have been reproduced in excellent illustrations. Volumes 1 and 2, covering military activity in Canada from the 1800s through 1945, will be published in due course and will follow the style and format of Volume 3. SPECIAL OFFER to members: Buy 'The BNAPS Catalogue of Canadian Military Mail Markings, Volume 3 – From Victory in 1945 to Afghanistan' at the members' price and you may also purchase the two volume 'Canadian Military Postal Markings' by Bailey and Toop' (Stock # B4h429.0), at a special net price for members of C$ 45.00. The books will be mailed together to minimize postage costs.